Preview performances Jan. 31 & Feb. 1at 7:30 pm. Wed-Sun at 7:30 PM, Sat and Sun at 2:00 PM. Tickets $45; Theater Mania 212-352-3101, 866-811-4111. Playwright Sophia Romma (who also writes under the name Sophia Murashkovsky) emigrated with her parents from Russia 27 years ago. She received her MFA at NYU. She is author of the film "Poor Liza," directed by Slava Tsukerman ("Liquid Sky") starring Ben Gazzara, Lee Grant and Barbara Babulova. The film adapts a classic Russian story by Nikolai Karamzin about a beautiful peasant girl who is seduced and forsaken by a young nobleman. "Poor Liza" won the Grand Prix Garnet Bracelet for best screenplay at the Gatchena Literature and Film Festival in St. Petersburg. She has had three productions at La MaMa: "Love, in the Eyes of Hope, Dies Last" (1997), a journey through contemporary Jewish/Russian immigration in a series of eight playlets, "Coyote, Take Me There!" (1999), a surrealistic work on the ordeal of immigration and the corruption of the American dream, and "Defenses Of Prague" (2004), a story of revenge set among the gypsies in 1968, on the brink of the Soviet invasion of Prague. Her other plays include "Lenin Bound" and "The Language of the Gods." She has produced the short narrative films "Commercial America in the 90s" and "The Frozen Zone." Her book of poetry, "God and My Good," was published by the Gorky Literary Institute and is now up for a literary award for Poetry of the Year. 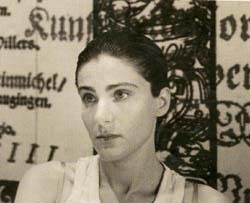 In 2005, Ms. Romma saw the publication of her contemporary art catalogue, "Essence of Art—Essence of Life," presented at the Hermitage Museum in St. Petersburg. She recently earned a Ph.D. at the prestigious Gorky Institute of Literature in Moscow. She teaches American Literature at Touro College, runs a playwriting and screenwriting workshop at the Frederick Douglass Creative Arts Center and occasionally instructs screenwriting at McGill University in Montreal.